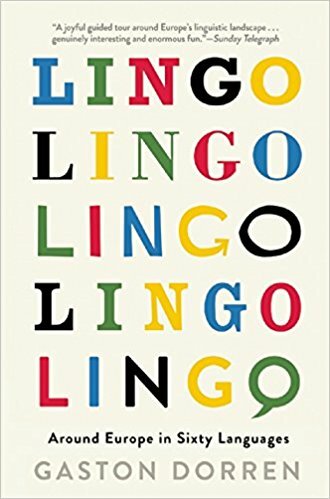 A friend of mine went all the way to the United States and all she bought for me was this book, “Lingo”. The similarity between the name of this blog, Lingoblog.dk and the book is purely coincidental. The author of Lingo is the Dutch language journalist Gaston Dorren. 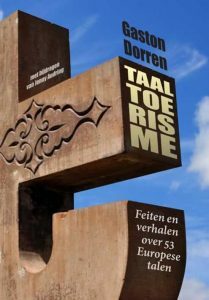 Taaltoerisme (language tourism) book in Dutch. Lingo is an English adapted version of his Dutch book Taaltoerisme, or “language tourism”, which Dorren wrote a few years ago. A respected friend and colleague had read the book in its Dutch version, and his judgment was negative. Therefore I had never developed an interest in the book, even though its topic interests me. From my teenage years I chose my holiday destinations regularly because I was intrigued by the local languages spoken there. My colleague’s judgment of the book reminded me of an experience that I had in correspondence with Gaston Dorren, the author of Lingo, in 2013, about something else. A relative of mine had gone all the way to the Netherlands and all she brought for me was the Taalkalender “language calendar”. That is a day-by-day calendar with one sheet per day. There is some text and/or image on the front page and something on its back, which you can read after you tear off the sheet of that day. In this way it tells you every day something interesting or funny about language: etymology, advice, place names, funny errors in newspapers, and also Mr. Dorren’s contributions about the languages of Europe. Every Thursday Dorren presented some question about some European language, and on the back of the sheet you could find the answer. One day Dorren dealt with Basque, a language that I have studied and at one point learned to converse in. But what he had written was obviously wrong. So I wrote to him to point out his error, but he insisted that he was right. So I thought, am I crazy, or is he, and I consulted another bascologist, who made it clear: Dorren is wrong. So I wrote to Dorren again, now backed up with a second opinion, but still Dorren claimed he was right, and that the phenomenon was similar to what is found in Scandinavian languages. So I gave up: he knew better. And he was also wrong about Scandinavian. I never even attempted to get hold of the Taaltoerisme book. But one cannot look a given horse in the mouth – a Dutch expression that means that you cannot criticize what is given to you – so I felt that I had to read the book, and I did read Dorren’s book from cover to cover. The book contains 60 short chapters on European languages from Albanian, Angloromani and Armenian to Ukrainian and Welsh. “European” is defined geographically, and includes for instance articles about Icelandic, Gaelic (Ireland), Sami (North Scandinavia), Maltese (Malta), Turkish (Turkey) and Ossetian (Caucasus), but nothing about Kurdish, Berber, Greenlandic, Guadeloupe Creole – all connected with Europe in different ways. World map of the European Union before Brexit. In all these chapters Dorren focuses mostly on one particularity, often the spelling (Turkish went from Arabic to Roman script, Welsh words change consonants in the beginning of words), but also speed of talking (Spanish), language use (sexist use of diminutives in Italian), language contact (Sorbian and Hungarian were inspired by neighboring languages to develop definite articles), language revival (there are children again who learn Manx in school), but rarely grammar (Basque is ergative, i.e. objects get the same case ending as the subject when there is no object). Phineas Q. Phlogiston, Ph.D. from the Unintentional University of Lghtnbrgstn explains Basque ergativity in a cartoon. From: the Speculative Grammarian. Sociolinguistic, historical and lexical information is included as well, such as the number of words for snow in Sami, or who was the last speaker of Old Cornish, how many people speak Cornish today, or who created a literary standard from Slovak. Dorren writes well. He is informative, he tries to be funny, and the translation is excellent. But is he always factually correct? With a book of this scope, covering topics like obligatory schooling in Monégasque by rich people’s children in tax haven Monaco, to the myths about sign languages, errors are unavoidable. I estimate one or two imprecisions (rarely downright errors) per page in such a book, are acceptable in my view. I am not sure, however, whether all speakers of the languages he deals with are happy about his writings. My Irish friend was somewhat furious about the Gaelic chapter. 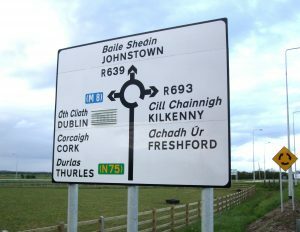 Bilingual road sign in Ireland. As a Dane (well, if Støjbjerg/Noise Mountain would allow me to be one, ánd if I would pass the test and 14 other criteria to become part of the fifth happiest nation on earth, ánd if I had the wish to be a Dane), I felt slightly insulted by his story about Danish. Once it was spoken on four continents, Dorren writes, and now only in one tiny country, just slightly bigger than his own home country, the Netherlands. He describes the situation of Danish as if speaker numbers of a former world power have undergone an enormous decline in the past centuries. He suggests that Danish was once spoken in Norway, Sweden, Iceland, the Danish West Indies, India, Africa, South Slesvig, Greenland, but currently almost exclusively in Denmark. In reality, though, the number of speakers of Danish in Africa, India and the Caribbean was never more than a few hundred in all. No doubt there were more speakers of Danish in the American Midwest (not mentioned) than in these Danish overseas colonies. The Danish West Indies, for instance, were dominated by Dutch speakers, later Creole Dutch, and German speakers rather than Danes went to the Danish Indian colonies because the Danes did not want to leave their corn fields and towns. Probably the number of speakers of Danish has never been as extensive as in the 21st century, with perhaps about 5,5 millions. 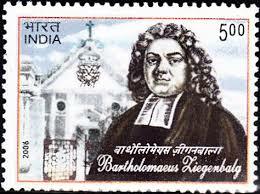 This German man represented Denmark in India. For almost each chapter, Dorren lists, if possible, words borrowed into English from these languages, and he recommends some handy words that English lacks. Narwhal is listed as a Danish borrowing into English (even though these animals live only in Arctic waters), and he recommends the terms mormor, morfar, farmor and farfar – four terms for each of your grandparents – which are lacking in English. Is Lingo a good book? In the front part it contains 18 enthusiastic quotes with “praise for Lingo”, filling three whole pages by American and British media. Journalists find the book “wonderful”, “a delight”, “fun”, “fascinating”, “amusing”, “bubbly”, “intriguing” or “joyful”. So if that is what you are looking for, and you do not know much about the languages of Europe, get the book. If you have a degree in linguistics, you are probably less interested in letters, writing systems and words than Dorren, who is listed on the cover as “a linguist, journalist and polyglot”. If I have the same error rate in my writing as Dorren, there will be one or two errors in this contribution. You can write to me if you spot them. Thank you. Now I finally understand why he reacted that way on our criticism. He was thorny. A translation of my name probably indicates that I produce hot air. Why are there so many different types of “R”?